Hindol Brahmbhatt’s aesthetic instinct creates a never-seen-before version of the seen-by-all forms of Indian gods and goddesses. Unique in its medium and technique, the show is a fascinating experience of Brahmbhatt’s exceptional perceptiveness. Hear what his artworks at his solo show ‘Voice of Silence’ have to whisper. A quote from the insightful Professor Dumbledore of the Harry Potter series explains the intriguing nomenclature of this art exhibition perfectly – “Of course it is happening inside your head, Harry, but why on earth should that mean that it is not real?” I had a similar thought when I entered the corridors of Hutheesing Art Gallery to glance at the 17 artworks of Hindol Brahmbhatt from his upcoming solo exhibition ‘Voice of Silence’. We all talk to ourselves, often through our quiet inner voices. Particularly when we pray, it is the silent voice of devotion that becomes the call of our beliefs. 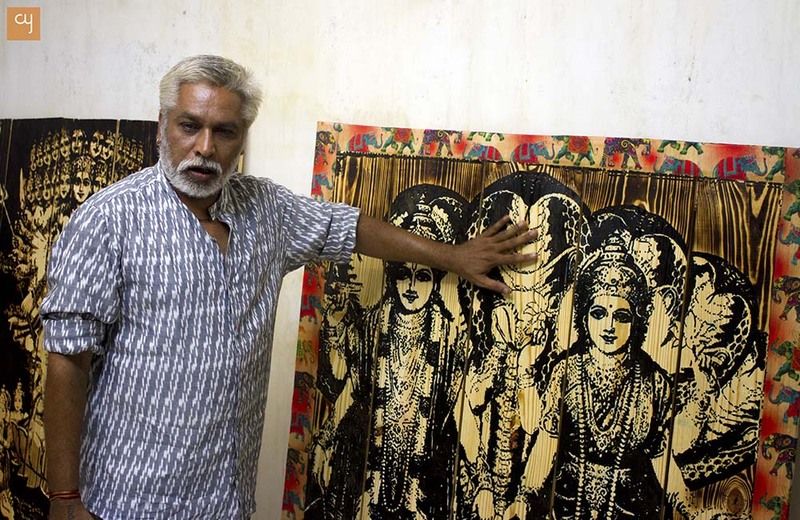 Brahmbhatt’s artworks, the seventeen wooden portraits, are monumental reinterpretations of Indian gods and goddesses. In the artwork manifests, artists deep-rooted connection with these forms, and for the viewer, it is reminiscent of his/her connection with these forms. Hence in more ways than one, ‘Voice of Silence’ is an apt title to the majestic exhibition. As I spent more time with the works, it dawned upon me that the works are much more than recreations of the ever-popular Indian mythology forms. When it comes to Indian mythology in Art, the name that always comes to the mind is of the legendary painter Raja Ravi Varma, credited with giving form to these mythic divine entities. Having said that, Brahmbhatt is firmly grounded in his own space and aesthetic, leaving no scope for any parallels. Each work eventually becomes much more than the popular symbolism attached to them. For example the 60 inch x 48 inch Lakshmi Narayan portrait is replete with all the symbolism, but the choice of medium and artistic use of Shellac coupled with Silk Textile, elevates the work from being a representative form to an artistic expression. 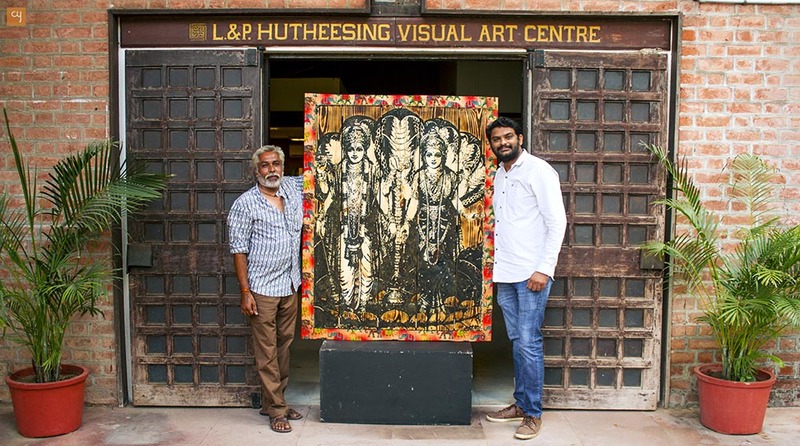 What also caught my attention is the Vaibhav Laksmi portrait, where the artist infuses the aura of the goddess with gold foil. The burnt wood, use of shellac and gold foil and touches of enamel it all comes together and reaches the viewer in a silent but substantial way. 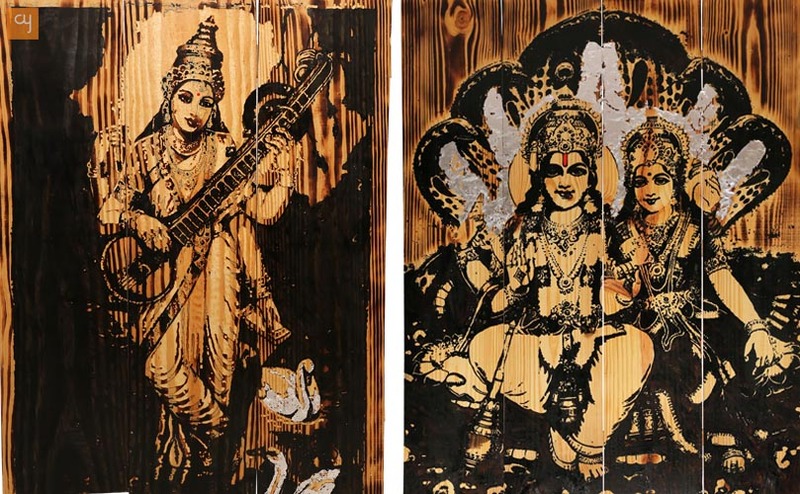 The artist’s efforts at reinterpreting mythology using a challenging mix of materials, primarily burnt wood, result in creation of fascinating aura in the art. In each work one could see the painstaking effort being made to make them an aesthetic manifestation of his inner Voice of Silence. It was so heartening to listen to a passionate Brahmbhatt explaining his technique in detail – “I prefer using German Cheel wood and initiate the process by burning the whole medium with a blow torch. Then I extend the procedure by painting it with bitumen. Through its property of constancy, bitumen extends the lifespan of the artworks drastically. I then use a small grinder to carve the details and shape the character of my paintings. I have of late challenged my aesthetics by multi-layering the artworks with silver and gold foil.” The series is full of spell binding works, be it the majestic Ganesha or the benign Saraswati. Brahmbhatt, has indulged in this process since 1998, inspired by the working method of German contemporary artist Anselm Kiefer and the creative vision of American pop-art painter Andy Warhol. The show is a beautiful culmination of artist’s 2 decades of work with this medium. However it is difficult to classify this work into a particular genre. With hints of Neoclassicism in its form and shades of Neo-expressionism in its nature , Brahmbhatt’s ‘Voice of Silence’ is an important work in the depiction of Indian gods and goddesses by Indian artist. 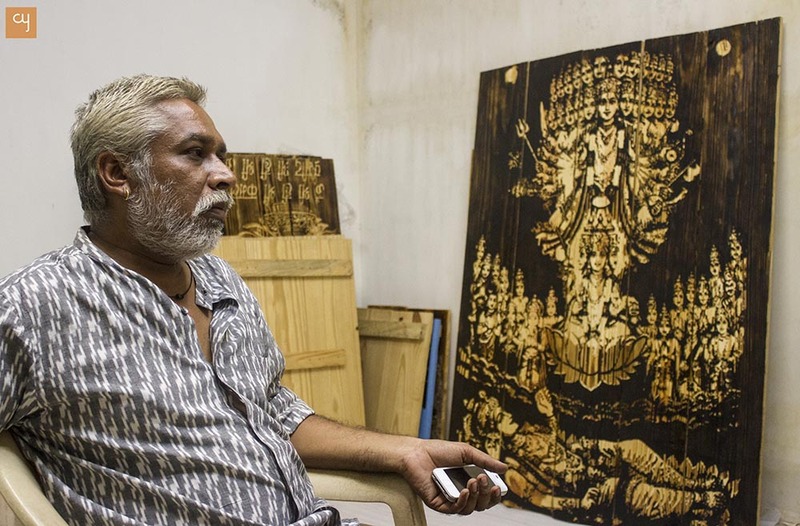 Those who follow his work and have seen his ‘Hind Swaraj’ series, will be surprised, that though primarily wood, this oeuvre is distinct in every way. A pleased and beaming Giriraj Kadia, curator of the show shares his vision on putting together this solo by Hindol Brahmbhatt, “I have had this idea of presenting the impressive artworks of Hindol Bhai since December 12, 2012; ever since I organised a group exhibition for 12 artists, in which Hindol Bhai contributed two of his paintings, one on Chaturbhuj and the other on Pink Floyd. The response from audiences left me bewildered, and it took me five years to create an environment for Hindol Bhai’s solo show. His technique, texture, experimentation with mediums, and variations in themes is what attract me towards his work the most. This is the first time that his mythological artworks – which will leave audiences in a trance – will be displayed under a single roof” And the curator has ensured that the exhibition becomes a sensory experience for the connoisseurs. The ambience is being carefully created to add to the ether of the gallery. Hindol Brahmbhatt, who envisions creating a series of artworks soon on famous rock stars, including Bob Dylan, is all but a restricted soul. 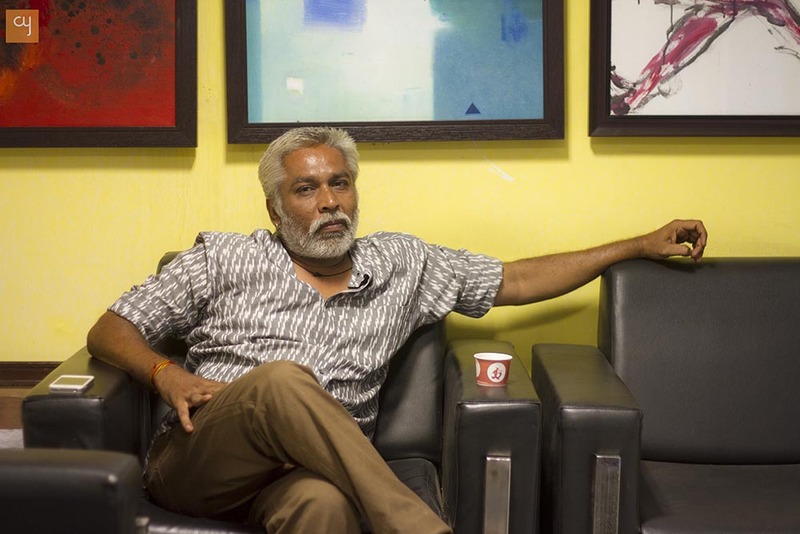 Having started his journey from MS University, Baroda, the artist tested his fate in the major cities of Mumbai and Delhi before settling into his studio in the heritage city of Ahmedabad. The exhibition Voice of Silence houses a series of paintings that cannot go unnoticed. They are ready to take audiences on a “trance journey” – in Kadia’s words –through their holy aura, between September 30 and October 6, 2017. The mythological theme is indeed amplified by the exhibition’s strategic opening, scheduled on the auspicious day of Dussehra.